Congenital diaphragmatic hernia (CDH) affects approximately 1 in 2000 newborns. Although great strides have been made in the management of CDH, significant morbidity and mortality persist. The current mainstay of treatment of CDH involves stabilization and respiratory support at birth, followed by closure of the diaphragmatic defect, which returns the abdominal organs to the abdominal cavity and makes room in the chest for the hypoplastic lung to grow. Whereas some specialized centers report a survival rate of close to 90% with this management, pooled results from more than 50 centers worldwide indicate the overall survival rate to be 71% with this standard postnatal therapy (CDH Study Group, September 2015). Specific morbidities in survivors include neurodevelopmental, nutritional, sensorineural hearing, and pulmonary function deficiencies, all of which are most likely attributable to the severity of lung hypoplasia and pulmonary hypertension that accompany CDH. [1, 2] The severe consequences of this congenital anomaly have led investigators to pursue methods of correcting CDH or its main consequence, lung hypoplasia, prior to birth; this allows more normal postnatal function. However, as advances were made in neonatal care, the postnatal survival rate among patients undergoing standard care (without fetal intervention) improved. In addition, pioneers in this endeavor found that the fetuses who could benefit most from fetal repair were also those who were most likely to die of the procedure. The main challenge for these fetuses was that the liver was herniated into the chest, and when the liver was reduced back into the abdomen during open fetal repair, the blood flow through the umbilical vein and inferior vena cava became occluded, resulting in death of the fetus. Fetuses without liver herniation typically had sufficient lung development to ensure a relatively good outcome with standard postnatal care. In the 1990s, the development and implementation of minimally invasive surgical techniques advanced at a rapid pace. The manufacture of small telescopes and various new surgical instruments allowed for further innovations. Simultaneously, irritation of the uterus and the threat of preterm labor were identified as major hurdles in fetal interventions. Schematic of fetal tracheal balloon occlusion, using a catheter-based detachable balloon that is placed through the side channel of the fetoscope. Identification of fetuses with CDH who may benefit from fetal tracheal occlusion has been a major challenge. Once the diagnosis of CDH is confirmed by an experienced radiologist by means of either ultrasonography or magnetic resonance imaging (MRI), a careful evaluation must be conducted for any other major anomalies, such as cardiac defects or chromosomal abnormalities. In addition, any maternal operative risk factors, such as any significant underlying medical conditions, must be considered. The LHR is a measurement that can be made with ultrasonography or MRI and quantifies the relative size of the lungs. [22, 23] An LHR of 1.0 or less signifies severe lung hypoplasia due to the CDH. A complete listing of inclusion and exclusion criteria for fetal intervention for CDH is outlined below and in Contraindications. After the original randomized controlled trial of fetal endoscopic tracheal occlusion performed at UCSF,  other groups demonstrated an early survival benefit. [25, 26, 21] These studies were limited by the complex nature of the postnatal management of patients with CDH and numerous variables that are difficult to control, but overall, the therapy remains very promising for severely affected fetuses. Long-term functional outcomes following fetal tracheal occlusion for CDH have yet to be reported. Chiu PP, Sauer C, Mihailovic A, Adatia I, Bohn D, Coates AL, et al. The price of success in the management of congenital diaphragmatic hernia: is improved survival accompanied by an increase in long-term morbidity?. J Pediatr Surg. 2006 May. 41(5):888-92. [Medline]. Cortes RA, Keller RL, Townsend T, Harrison MR, Farmer DL, Lee H, et al. Survival of severe congenital diaphragmatic hernia has morbid consequences. J Pediatr Surg. 2005 Jan. 40(1):36-45; discussion 45-6. [Medline]. Harrison MR, Adzick NS, Longaker MT, Goldberg JD, Rosen MA, Filly RA, et al. Successful repair in utero of a fetal diaphragmatic hernia after removal of herniated viscera from the left thorax. N Engl J Med. 1990 May 31. 322(22):1582-4. [Medline]. Harrison MR, Adzick NS, Flake AW, Jennings RW, Estes JM, MacGillivray TE, et al. Correction of congenital diaphragmatic hernia in utero: VI. Hard-earned lessons. J Pediatr Surg. 1993 Oct. 28(10):1411-7; discussion 1417-8. [Medline]. Wilson JM, DiFiore JW, Peters CA. Experimental fetal tracheal ligation prevents the pulmonary hypoplasia associated with fetal nephrectomy: possible application for congenital diaphragmatic hernia. J Pediatr Surg. 1993 Nov. 28(11):1433-9; discussion 1439-40. [Medline]. DiFiore JW, Fauza DO, Slavin R, Peters CA, Fackler JC, Wilson JM. Experimental fetal tracheal ligation reverses the structural and physiological effects of pulmonary hypoplasia in congenital diaphragmatic hernia. J Pediatr Surg. 1994 Feb. 29(2):248-56; discussion 256-7. [Medline]. Hedrick MH, Estes JM, Sullivan KM, Bealer JF, Kitterman JA, Flake AW, et al. Plug the lung until it grows (PLUG): a new method to treat congenital diaphragmatic hernia in utero. J Pediatr Surg. 1994 May. 29(5):612-7. [Medline]. Adzick NS, Outwater KM, Harrison MR, Davies P, Glick PL, deLorimier AA, et al. Correction of congenital diaphragmatic hernia in utero. IV. An early gestational fetal lamb model for pulmonary vascular morphometric analysis. J Pediatr Surg. 1985 Dec. 20(6):673-80. [Medline]. Harrison MR, Adzick NS, Flake AW, VanderWall KJ, Bealer JF, Howell LJ, et al. Correction of congenital diaphragmatic hernia in utero VIII: Response of the hypoplastic lung to tracheal occlusion. J Pediatr Surg. 1996 Oct. 31(10):1339-48. [Medline]. Skarsgard ED, Meuli M, VanderWall KJ, Bealer JF, Adzick NS, Harrison MR. Fetal endoscopic tracheal occlusion ('Fetendo-PLUG') for congenital diaphragmatic hernia. J Pediatr Surg. 1996 Oct. 31(10):1335-8. [Medline]. Bealer JF, Skarsgard ED, Hedrick MH, Meuli M, VanderWall KJ, Flake AW, et al. The 'PLUG' odyssey: adventures in experimental fetal tracheal occlusion. J Pediatr Surg. 1995 Feb. 30(2):361-4; discussion 364-5. [Medline]. Harrison MR, Mychaliska GB, Albanese CT, Jennings RW, Farrell JA, Hawgood S, et al. Correction of congenital diaphragmatic hernia in utero IX: fetuses with poor prognosis (liver herniation and low lung-to-head ratio) can be saved by fetoscopic temporary tracheal occlusion. J Pediatr Surg. 1998 Jul. 33(7):1017-22; discussion 1022-3. [Medline]. Harrison MR, Albanese CT, Hawgood SB, Farmer DL, Farrell JA, Sandberg PL. Fetoscopic temporary tracheal occlusion by means of detachable balloon for congenital diaphragmatic hernia. Am J Obstet Gynecol. 2001 Sep. 185(3):730-3. [Medline]. Harrison MR, Keller RL, Hawgood SB, Kitterman JA, Sandberg PL, Farmer DL, et al. A randomized trial of fetal endoscopic tracheal occlusion for severe fetal congenital diaphragmatic hernia. N Engl J Med. 2003 Nov 13. 349(20):1916-24. [Medline]. Keller RL, Hawgood S, Neuhaus JM, Farmer DL, Lee H, Albanese CT, et al. Infant pulmonary function in a randomized trial of fetal tracheal occlusion for severe congenital diaphragmatic hernia. Pediatr Res. 2004 Nov. 56(5):818-25. [Medline]. Ruano R, Yoshisaki CT, da Silva MM, Ceccon ME, Grasi MS, Tannuri U, et al. A randomized controlled trial of fetal endoscopic tracheal occlusion versus postnatal management of severe isolated congenital diaphragmatic hernia. Ultrasound Obstet Gynecol. 2012 Jan. 39(1):20-7. [Medline]. Deprest J, De Coppi P. Antenatal management of isolated congenital diaphragmatic hernia today and tomorrow: ongoing collaborative research and development. Journal of Pediatric Surgery Lecture. J Pediatr Surg. 2012 Feb. 47(2):282-90. [Medline]. Deprest JA, Nicolaides K, Gratacos E. Fetal surgery for congenital diaphragmatic hernia is back from never gone. Fetal Diagn Ther. 2011. 29(1):6-17. [Medline]. Persico N, Fabietti I, Ciralli F, Gentilino V, D'Ambrosi F, Boito S, et al. Fetoscopic Endoluminal Tracheal Occlusion in Fetuses with Severe Diaphragmatic Hernia: A Three-Year Single-Center Experience. Fetal Diagn Ther. 2017. 41 (3):215-219. [Medline]. Grivell RM, Andersen C, Dodd JM. Prenatal interventions for congenital diaphragmatic hernia for improving outcomes. Cochrane Database Syst Rev. 2015 Nov 27. CD008925. [Medline]. Al-Maary J, Eastwood MP, Russo FM, Deprest JA, Keijzer R. Fetal Tracheal Occlusion for Severe Pulmonary Hypoplasia in Isolated Congenital Diaphragmatic Hernia: A Systematic Review and Meta-analysis of Survival. Ann Surg. 2016 Dec. 264 (6):929-933. [Medline]. Metkus AP, Filly RA, Stringer MD, Harrison MR, Adzick NS. Sonographic predictors of survival in fetal diaphragmatic hernia. J Pediatr Surg. 1996 Jan. 31(1):148-51; discussion 151-2. [Medline]. Büsing KA, Kilian AK, Schaible T, Debus A, Weiss C, Neff KW. Reliability and validity of MR image lung volume measurement in fetuses with congenital diaphragmatic hernia and in vitro lung models. Radiology. 2008 Feb. 246(2):553-61. [Medline]. Lazar DA, Ruano R, Cass DL, Moise KJ Jr, Johnson A, Lee TC, et al. Defining "liver-up": does the volume of liver herniation predict outcome for fetuses with isolated left-sided congenital diaphragmatic hernia?. J Pediatr Surg. 2012 Jun. 47(6):1058-62. [Medline]. Ruano R, Yoshisaki CT, da Silva MM, Ceccon ME, Grasi MS, Tannuri U. A randomized controlled trial of fetal endoscopic tracheal occlusion versus postnatal management of severe isolated congenital diaphragmatic hernia. Ultrasound Obstet Gynecol. 2012 Jan. 39(1):20-7. [Medline]. Jani JC, Nicolaides KH, Gratacós E, Valencia CM, Doné E, Martinez JM, et al. Severe diaphragmatic hernia treated by fetal endoscopic tracheal occlusion. Ultrasound Obstet Gynecol. 2009 Sep. 34(3):304-10. [Medline]. Júnior EA, Tonni G, Martins WP, Ruano R. Procedure-Related Complications and Survival Following Fetoscopic Endotracheal Occlusion (FETO) for Severe Congenital Diaphragmatic Hernia: Systematic Review and Meta-Analysis in the FETO Era. Eur J Pediatr Surg. 2016 Aug 14. [Medline]. Jani J, Valencia C, Cannie M, Vuckovic A, Sellars M, Nicolaides KH. Tracheal diameter at birth in severe congenital diaphragmatic hernia treated by fetal endoscopic tracheal occlusion. Prenat Diagn. 2011 Jul. 31(7):699-704. [Medline]. Enriquez G, Cadavid L, Garcés-Iñigo E, Castellote A, Piqueras J, Peiró JL. Tracheobronchomegaly following intrauterine tracheal occlusion for congenital diaphragmatic hernia. Pediatr Radiol. 2012 Aug. 42(8):916-22. [Medline]. Speggiorin S, Fierens A, McHugh K, Roebuck DJ, McLaren CA, Mok Q. Bronchomegaly as a complication of fetal endoscopic tracheal occlusion. A caution and a possible solution. J Pediatr Surg. 2011 May. 46(5):e1-3. [Medline]. McHugh K, Afaq A, Broderick N, Gabra HO, Roebuck DJ, Elliott MJ. Tracheomegaly: a complication of fetal endoscopic tracheal occlusion in the treatment of congenital diaphragmatic hernia. Pediatr Radiol. 2010 May. 40(5):674-80. [Medline]. Deprest J, Nicolaides K, Done' E, Lewi P, Barki G, Largen E. Technical aspects of fetal endoscopic tracheal occlusion for congenital diaphragmatic hernia. J Pediatr Surg. 2011 Jan. 46(1):22-32. [Medline]. Hirose S, Farmer DL, Lee H, Nobuhara KK, Harrison MR. The ex utero intrapartum treatment procedure: Looking back at the EXIT. J Pediatr Surg. 2004 Mar. 39(3):375-80; discussion 375-80. [Medline]. Flageole H, Evrard VA, Piedboeuf B, Laberge JM, Lerut TE, Deprest JA. The plug-unplug sequence: an important step to achieve type II pneumocyte maturation in the fetal lamb model. J Pediatr Surg. 1998 Feb. 33(2):299-303. [Medline]. Jelin EB, Etemadi M, Encinas J, Schecter SC, Chapin C, Wu J, et al. Dynamic tracheal occlusion improves lung morphometrics and function in the fetal lamb model of congenital diaphragmatic hernia. J Pediatr Surg. 2011 Jun. 46(6):1150-7. [Medline]. The fetoscope enters the oropharynx and passes through the glottis into the trachea. The mainstem bronchi are seen, and then the detachable balloon is passed through a side-channel of the fetoscope into the trachea, inflated, and detached in an appropriate position. The fetoscope is then removed and ultrasound confirms the balloon position in the trachea. 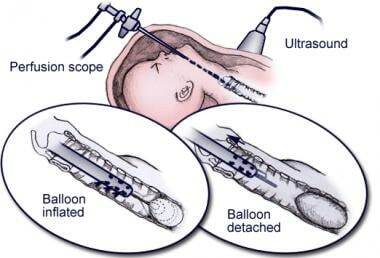 Current practice is to repeat fetoscopy and remove the balloon after 4-6 weeks. Video courtesy of Division of Pediatric Surgery, University of California, San Francisco, School of Medicine. Fetoscopic images of landmarks during percutaneous fetal tracheal balloon occlusion. From top left to right bottom: epiglottis, vocal cords, trachea, carina, inflated and detached balloon, vocal cords about to close over the balloon. Image courtesy of Division of Pediatric Surgery, University of California, San Francisco, School of Medicine.